When working with outside parties there are server considerations. First is how they are going to connect and where is the data stored. Connectivity can happen using a browser based client or a thick client. Each has its pros and cons. The thick client access has the most functionality and can also provide direct integration inside of many commonly used applications such as AutoCAD, MicroStation, Revit, Civil 3D, Microsoft Office, as well as other applications. It also offers increased performance via data compression and delta file transfer (DFT). Thick client access does require the installation of the ProjectWise Explorer on the desktop and requires port TCP 5800 for connectivity and file transfers. When utilizing the thick client it also gives added flexibility for routing since the ProjectWise Explorer can directly contact a ProjectWise Gateway Server, ProjectWise Caching Server, or ProjectWise Integration Server as the next server in the route. All three of these servers can pass routing information to the thick client. If added performance is needed, or in a larger office with many users a ProjectWise Caching Server may be utilized. Caching Servers can have a dual function. The first is being able to store files as their home location. The second is caching of files from remote offices. Thin client access is much easier since it works over standard web browsing ports. It also has capabilities to allow viewing and markup of CAD formats through a browser with no design markup of viewing tools installed. Browser users can check out/in files but need to understand that ProjectWise would be unaware of reference or x-ref attachments and require a scan be done on the file(s) after they have been checked in so any changes in references would be picked up, therefore it is recommended that CAD editors use thick client access to edit files. Viewers, markups, and Microsoft Office type users can use the browser based clients without any issues. Thin client users would also not be able to take advantage of DFT traffic, therefore users of larger files may benefit from thick client. Client to Server communications are done on ports TCP 5800 for thick client access and ports HTTP 80 and HTTPS 443 for browser based clients. All server to server communications will be on port TCP 5800. When working with a remote office port TCP 5800 will need to be open on any firewall between the ProjectWise Explorer (thick client) and the next link in the chain which may be a ProjectWise Caching Server, ProjectWise Gateway Server, or ProjectWise Integration Server. Also, any of the servers that are next in line would also need to communicate using TCP 5800. Browser based clients will utilize standard ports 80 and SSL 443 for communications. Browser traffic cannot be relayed by a Caching or Gateway Server. It must have direct contact to the ProjectWise Web Server. Once the traffic reaches the ProjectWise Web Server it will then communicate via port 5800 to the other servers to process requests. If dual authentication is needed then VPN access may be required as the first level of authentication with their ProjectWise login being the second. Other options may include a Citrix type connection to ProjectWise which is a supported configuration. 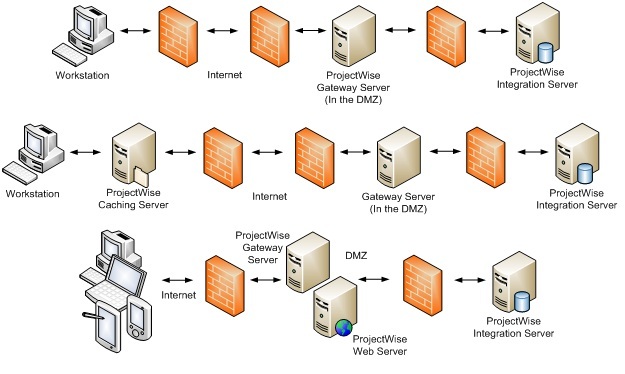 The diagram below represents some of the common routes that ProjectWise traffic can take when dealing with outside entities.